In this article we will run through some important sportfishing trolling tips. When fishing offshore with lures there are two important factors: what the skipper does, and what’s going down on the decks. The skipper needs to ensure the vessel is travelling at the right speeds, 7.5 knots is a good start. Choose your speed according to the weather conditions. If your lures are in the water and swimming well, its all good. Keep an eye out for baitfish, birds, and reef. 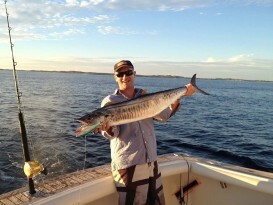 When fishing offshore, troll drop offs for species such as Mackerel. The magic number for Mackerel fishing is 16-18 metre drop offs. Follow your chart and keep on the ledge. Its then up to the guys on the deck to make sure you’ve got the right lures in the right place. Set up a trolling pattern keeping conditions in mind. If a little rough, consider running a simple two lure pattern. If conditions are bliss, you can troll up to 4-5 at a time. Vary your lure size when targeting sportfish. We opt for the Halco Laser Pro 190 with a big profile. This lure runs at 2m deep. Our second lure choice is then the smaller Laser Pro 160 with a deeper bib, running at around 6 metres. This allows the Laser Pro 160 deep diver lure to sit below the prop wash. When trolling for Mackerel, an important feature is the use of a trace. Halco Tackle Super Snap Traces are made of high quality Japanese componentry and very important to use when targeting teethed sportfish. Don’t be a victim of bite offs! In the video, Tim uses a 20” 60Lb Halco Tackle trace, connected to a short wind on leader and mono. When using braid, set the drag a little lighter. Monofilament allows a certain amount of stretch to absorb the shock, whereas braid allows no stretch so when a large fish hits, the force can be enough to tear the hook out. Use the snap trace to clip on the lure through the slip ring, and send it out. Its very important to stagger the lure to avoid a real mess! If trolling lures are staggered, when the boat turns sharply the lures wont tangle. Let the lure drift out about 40m, and fix the rod in the holder with the ratchet on. The second trolling lure is a deep diver and will be set shorter in the pattern at about 30 metres behind the boat. This allows the Laser Pro 160 deep diver to get down below the prop wash and into nice clean water. If offshore conditions allow, send a Halco Max out the back. This lure would stay about 1m under the surface, 50m behind the boat. That will take the one straggler fish, and quite often it’s the largest. A really good way to see your lure is running properly is to observe the rod tip. You’re looking for a rod tip that is bouncing nicely, with vibration through the rod tip. If the tip sags down and isn’t vibrating, it’s a good indication you’ve hooked seaweed or plastic and if that’s the case, bring it in to check. When landing your fish, make sure you remain nice and smooth and don’t try forcing the fish towards the boat. Instead, gather the line, take it easy, and get a mate ready to retrieve. Last moments are most important when sport fishing, as species like Mackerel can take a nice last minute lunge, so stay calm and watch their teeth when you get them in the boat. When you do decide to release your catch, remember to run some water through the gills before allowing it to swim. Watch the video for additional tips, and to see the Halco team in action.